When old billboards, fire towers and grain silos outlive their old purposes, there’s no need to tear them down – especially since they can be transformed into surprisingly modern, livable homes with views to die for. These 15 innovative conversion projects turn the unlikeliest of abandoned structures into dazzling contemporary residences while still preserving their historic features. 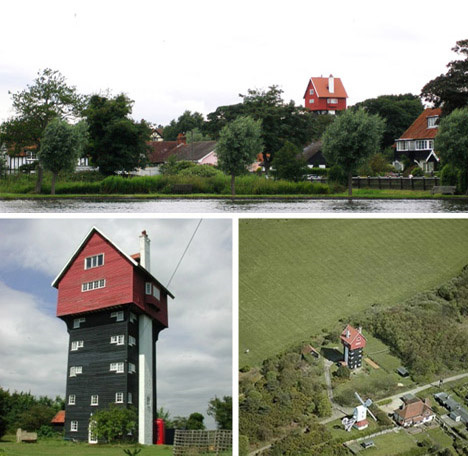 This water-tower-turned-house didn’t start out as an ordinary water tower or as a house. It was made to look like a house in the sky but once it was no longer needed to store water, the new owners turned it into an actual home.. 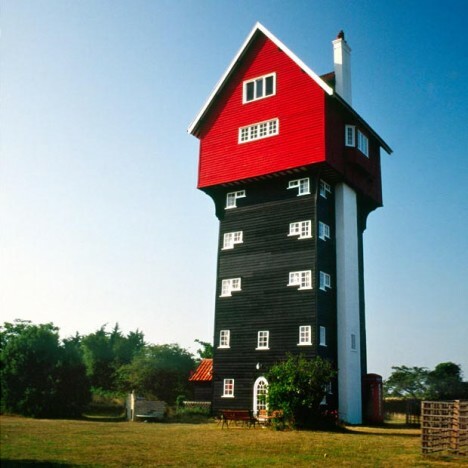 The House in the Clouds was built as a water tower for Thorpeness, Suffolk, in the United Kingdom. It was designed in 1923 was to disguise its tank with the appearance of a weather-boarded building more in keeping with local mock-Tudor and Jacobean architectural styles. The original capacity of the water tank was 50,000 imperial gallons (230,000 liters). After being rendered redundant in 1977 it was converted to a home in 1979. The building currently has five bedrooms and three bathrooms; it contains a total of 68 steps from top to bottom and is around 70 feet high. 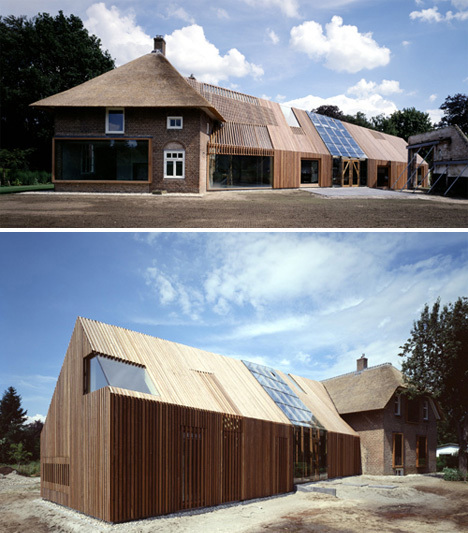 Old barns and farm buildings often fall into unsightly disuse, but this project by Bjarne Mastenbroek and his Amsterdam-based architecture firm SeARCH proves that such buildings can be not only rescued from ruin, but transformed into stunning hybrids of traditional and modern architecture. The this farmhouse and its outbuildings in Zutphen, Netherlands were given a sleek makeover with vast expanses of glass and an airy, bright interior. A rusting hulk of an old warehouse in an industrial district doesn’t exactly strike one as likely digs for a design and architecture team. 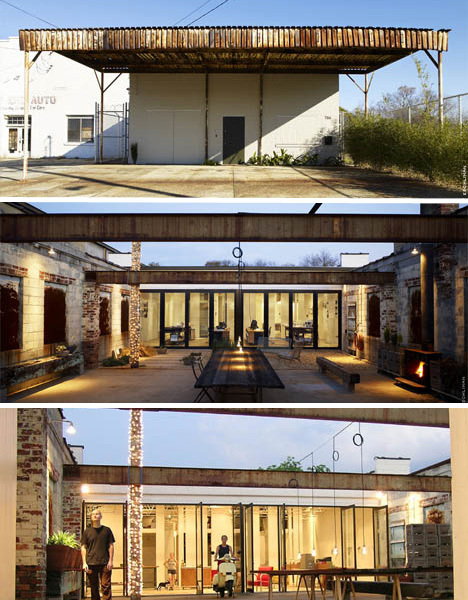 As the top photo depicts, this warehouse in Atlanta, Georgia didn’t look like much before bldgs got a hold of it and turned it into a combined residence and office space, leaving the old rusted beams and paint-chipped bricks in place to preserve a sense of age and history. Raise the alarm: these homes transformed from old fire towers are ablaze with beauty and eco-conscious creativity. 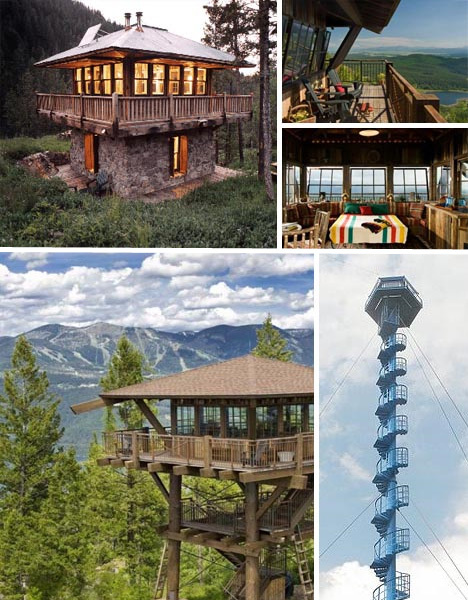 The height gives them a treehouse feel, not to mention the amazing views afforded by their lofty locations. They’re already built to withstand the elements, so it doesn’t take much to make them ready for habitation. With the addition of steeples and, in some cases, facades, train cars can be turned into places of worship with surprising ease. 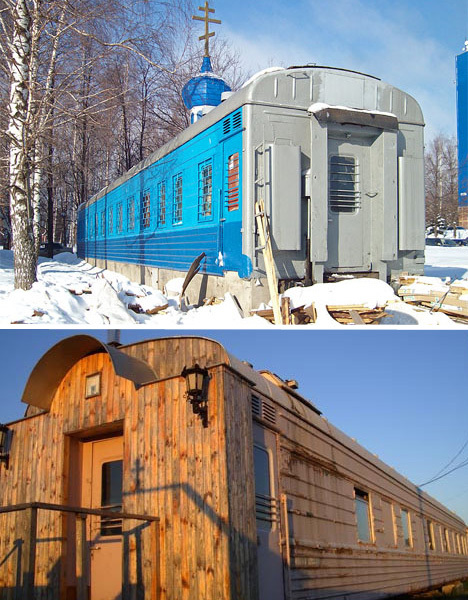 Many of these unusual conversions can be found in Russia, where abandoned railway cars are a common sight. It may be a long way from the grandeur of other Russian Orthodox churches, but it’s certainly an innovative way to upcycle these old structures. Grain silos dot the countryside, a symbol of simple rural living with their simple shapes and metal-clad exteriors. 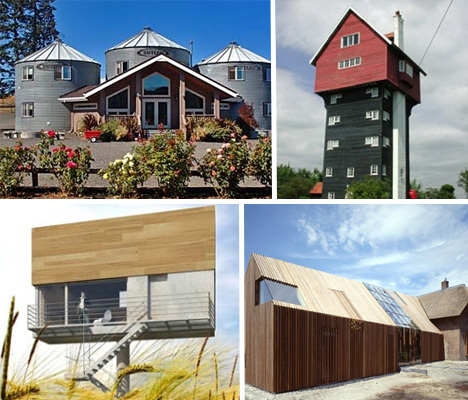 But they aren’t just for storing grain – they can be marvelous homes and hotels as well. 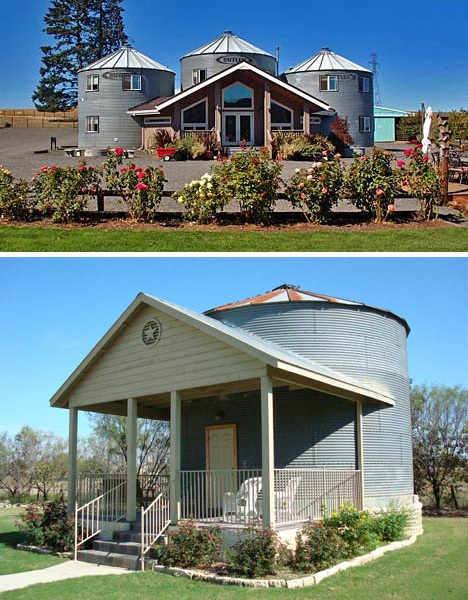 The Silo at the Gruene Homestead Inn has been transformed into a 1 bedroom loft apartment, while the Abbey Road Farm Bed & Breakfast has three grain silos incorporated into one large structure. All too often, old factories are allowed to sit and rot for years after they’re abandoned, but as this conversion shows, these locations can provide the perfect skeleton for modern housing. 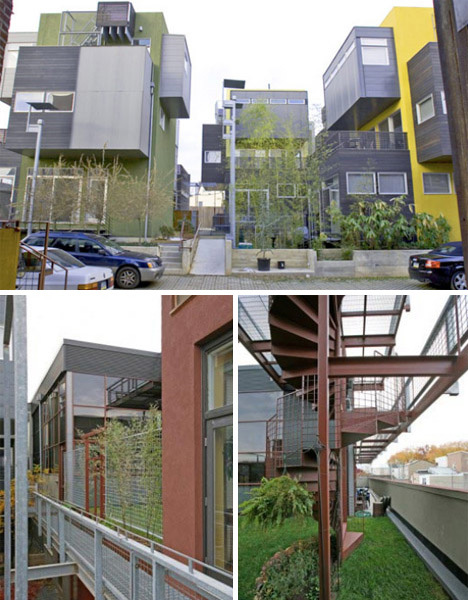 Located in Philadelphia, this condominium complex not only takes advantage of the bones of the factory buildings, but incorporates new eco-friendly features like rainwater harvesting and solar power. You might have a graveyard instead of a front lawn, but that’s a small price to pay for the vaulted ceilings and stained glass windows that come with living in an old church. 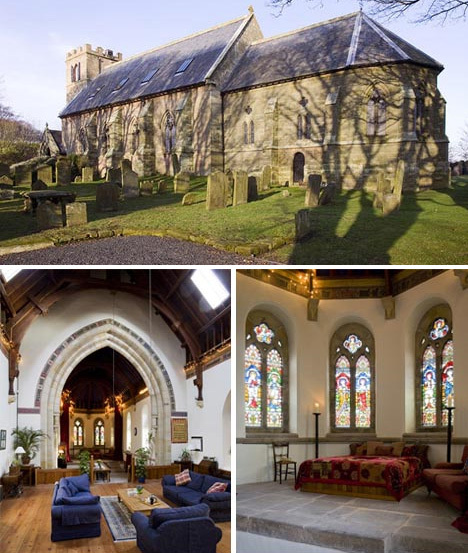 This restructured church in the English countryside still looks like an aging place of worship on the outside, but the inside is now a luxurious residence. 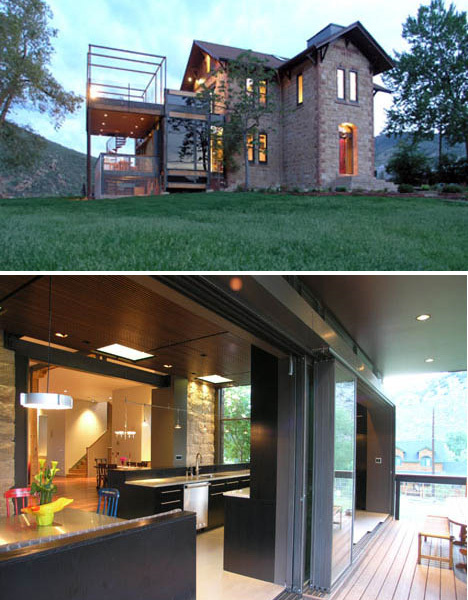 Another stunning blend of old and new architecture is this classic-schoolhouse-turned-home in Denver. The original stone structure dates back to the late 1800s, but an ultra-contemporary addition and modern interior make this home anything but quaint. While billboards aren’t likely to be on most people’s radar as potential dwellings, they do have the advantage of being in prime locations, especially in urban environments. 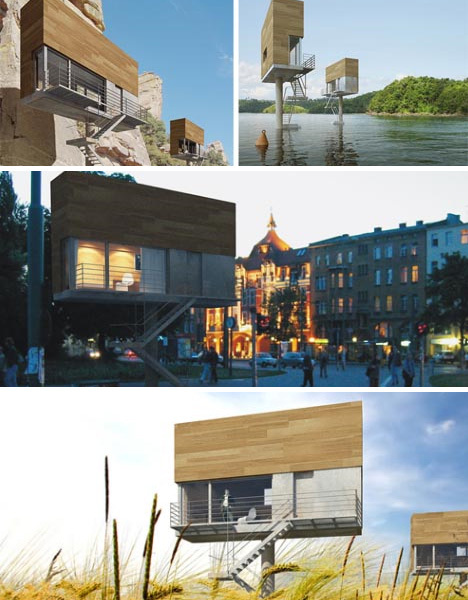 One proposal by Front Architects transforms these structures from advertisements to tiny modern homes made of wood, concrete and steel. Exchanging extra space for dazzling views and incredibly convenient locations isn’t such a big sacrifice, is it? Single-wide trailers aren’t exactly the height of modern residential architecture. But, that doesn’t mean they don’t have potential. Architect Michael Hughes is the brains behind Trailerwrap, a project that reinvents old trailers by preserving their portability but making them far more aesthetically pleasing. 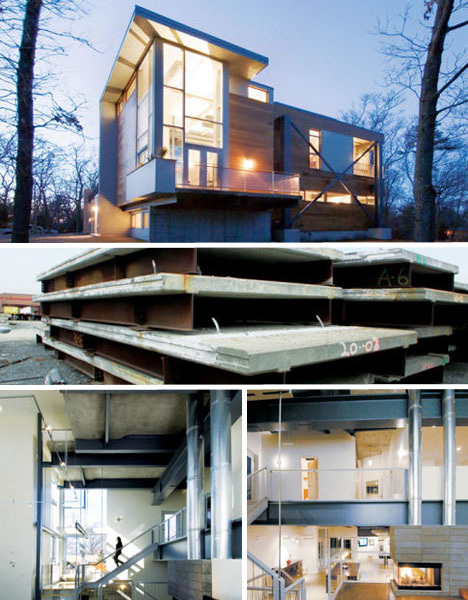 “It’s kind of like Junkyard Wars meets Habitat for Humanity,” says homeowner Paul Pedini of his one-of-a-kind upcycled residence, which incorporates 600,000 pounds of recycled materials – including an entire section of an old highway. 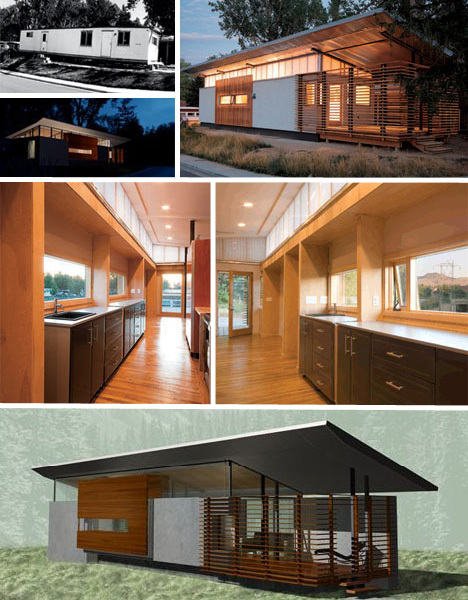 The highway panels were used to form the core structural center of the home, creating an interior that’s industrial, yet warm and welcoming. Few people would want to live in an old pig sty that’s falling apart at the seams, but the owners of this building saw potential in its historic shell. However, most conventional attempts to transform this pig barn into a home would have spoiled its architectural state. 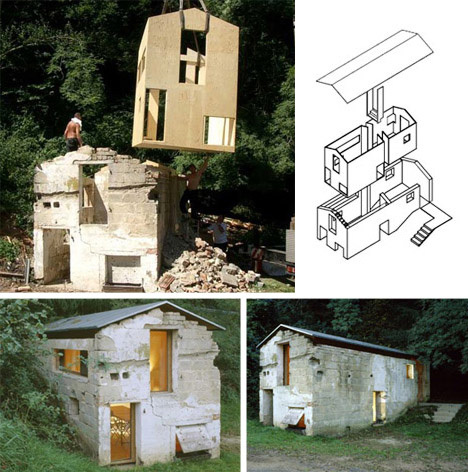 Amazingly enough, their solution was to drop an entire prefabricated home into the shell through the roof, with openings that correspond to those in the existing structure. It’s a quirky and charming A-frame home from the outside, but the origins of this cute little residence are pretty unexpected: it was once a standard car garage. 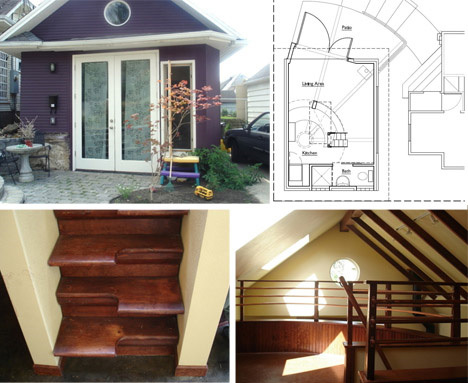 The owners fought with the city to get a permit and were finally allowed to transform the garage into a tiny but adorable home with lots of natural light, a space-saving alternating staircase and warm wood accents. There are thousands of abandoned oil rigs in the Gulf of Mexico, just waiting for some new purpose to save them from being scrapped or merely decaying into the sea. 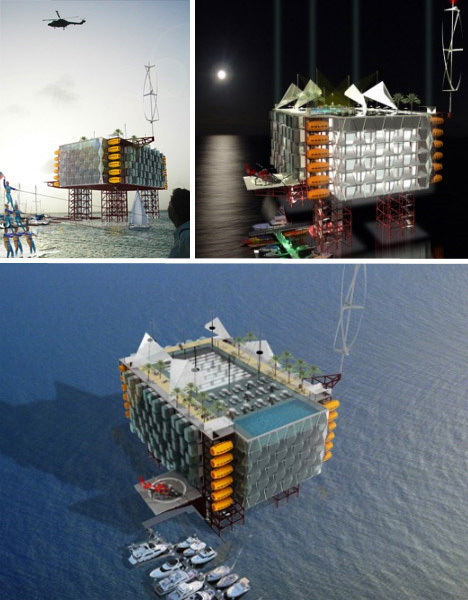 One architecture firm, Morris Architects, believes that these remote structures could be the perfect locations for upcycled luxury hotels and condos on the water. Combined, they could provide an astonishing 80,000 square feet of space, reachable only by boat or aircraft.